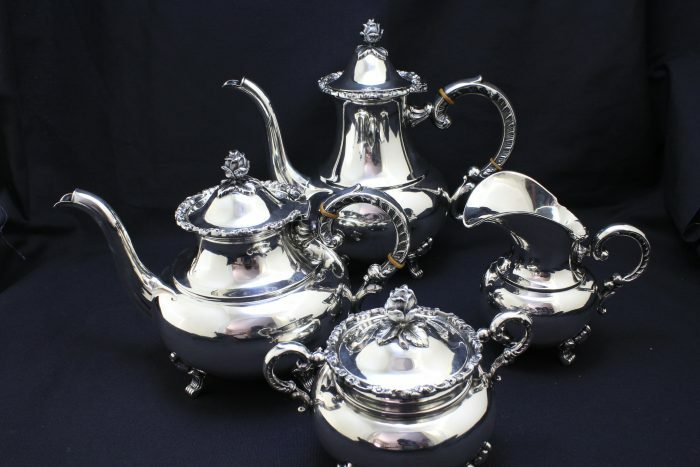 Are you looking for an Exquisite Sterling Silver Coffee, Tea, Creamer and Sugar Bowl Set? You have come to the right place. The Set is from Germany. Handarbeit meaning “Hand Made”The set is marked 925 – Half a moon and crown . With Handarbeit marking, Sterling Decorated with a rose and leaves on top of the Coffee, Tea, and Sugar Bowl Lids. The lids on the Coffee and Tea Pots are hinged. Both are in great shape. Rose with leaf on lids.